Belvedere by Lunt sterling silver flatware set of 32 pieces. 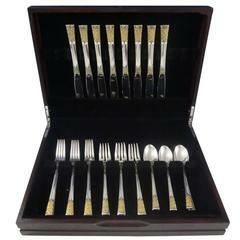 This set includes: 8 knives, 9" 8 forks, 7 1/4" 8 salad forks, 6 3/4" 8 teaspoons, 6" Includes bonus brand new storage chest. Excellent condition, with no monograms. Professionally polished to pristine condition and sealed in individual plastic sleeves prior to shipping. 100% satisfaction guaranteed!